It’s time to turn the page on the calendar and take on the New Year, whether we feel ready or not. December has past away, and January is here. Did you know that the name of our first month, January, comes from the name of a Roman deity? Janus, as he was known, had one face looking to the past and another faced toward the future. (This takes the old idea of “having eyes in the back of your head” to another level entirely!) And, while we may have only one face to work with, this time of year is typically a time we use to look at our past and project our best hopes upon the future. Whatever transpired in 2012—good, bad, or indifferent—is now in the past. “The past.” Maybe some of you reading this would rather not think about the past. There may be some pretty rough times you have weathered, mistakes you’ve made, and hurts that haven’t fully healed. A glance back in the “rearview mirror” of life isn’t high on your priority list! You’ve done your best to forget the past and move on. Forgiving, forgetting, and moving on into the future… there are a ton of self-help books out there that speak to these issues. They are pretty popular this time of year, in fact. But, as a follower of Jesus Christ, I am always curious as to the wisdom I might gain from those that have experienced past regrets and have tried to move on to a better future. I can think of no better example for someone who has “been there, done that” than Paul of Tarsus. The nice thing is, he wrote a large chunk of the Christian New Testament, and so we don’t have to guess at how he dealt with his past! Paul had good reason to want to forget his past… he had been an enemy of Jesus and his followers. In his zeal to uphold the religious system he knew, he had Jesus’ followers thrown in jail and even oversaw the stoning death of at least one (see Acts 7:58-8:1). But did Paul truly forget his past? When he came to realize the error of his ways and accept Jesus as his leader and was forgiven of his sins… did Paul bury his past never to be remembered? “Forgive and forget” is bumper-sticker theology that can’t be backed up by God’s revealed Word. I know this, not because I want to justify my own stubborn “holding on” to my past, but because I can see that whatever “forgetting” Paul did regarding his past, it did NOT involve ceasing to remember, or even omitting to mention that which had gone on before. Clearly, in order for Paul to say that he was the “biggest sinner of all” means he didn’t totally forget his past. Instead, Paul used his past as an example of just how messed up you can be and still have God forgive you! So… what kind of “forgetting” should we practice? Should we stuff the hurt and disappointments of 2012 down deep never to be remembered? Should we remember our past every time we mess up in the coming year, as “proof” that we’re just screwed up and there is nothing we can do about our condition? No! Here’s a hint from me to you about what might be the key… your “forgetting” should keep in mind forgiveness. Why forgiveness? Because grace is all about forgiveness. 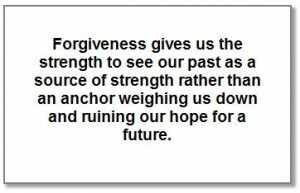 Forgiveness gives us the strength to see our past as a source of strength rather than an anchor weighing us down and ruining our hope for a future. Forgiveness is the pathway to hope. So, if you are still with me… might I suggest that instead of wasting your time dreaming up this year’s resolutions, try writing out a journal of all the highs and lows of 2012. Beside all the mistakes, sins and screw ups, write “forgiven”; and beside all the victories, high points, and great memories, write “thank you”. Then, spend some time in prayer and reflection. I think you’ll leave that time renewed and refreshed, more hopeful that 2013 can be a great year… not because you are going to be better, thinner, smarter, or more successful… but, because you have a great God that loves you, extends his grace and forgiveness to you, and asks you to do the same for others.